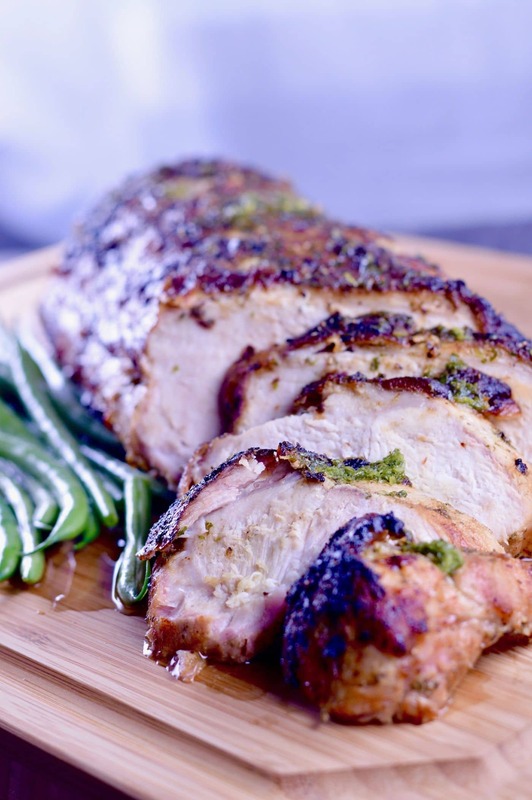 Juicy, tender, with hints of garlic and citrus this Grilled Cuban Mojo Pork Roast Recipe is an easy, yet impressive meal to serve for company. 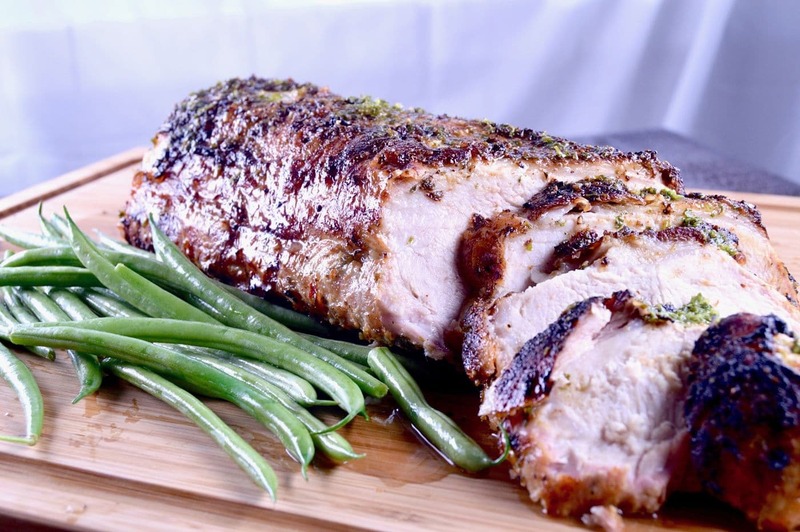 Grilling Season Recipes continue with this recipe for Grilled Cuban Mojo Pork Roast. This recipe is an adaptation from the 2014 movie Chef. The original recipe is done in the oven, but since its starting to get warm out, I wanted a version we could do on the grill. 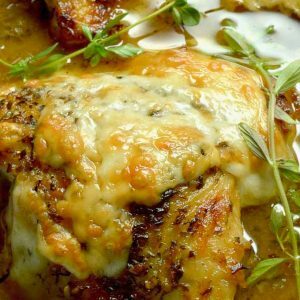 This recipe is easy enough you won’t be intimidated but is impressive enough you can use it for special occasion meals. Scroll down to just before the recipe at the bottom to see a video of just how easy it is to make this recipe! 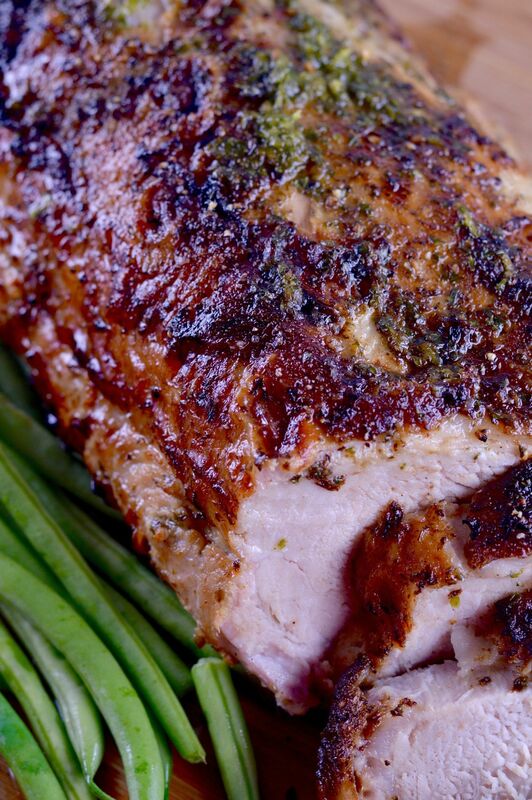 What does Mojo mean in this recipe for Grilled Cuban Mojo Pork Roast? Mojo in a cuban recipe means it is marinated in garlic, olive oil and citrus, in this case both lime and orange. Orange is the most common citrus flavor used in Mojo. I recommend a pork roast but it will work with a pork tenderloin too. You will need to reduce the cooking time since pork tenderloins tend to be smaller in diameter. Pay attention to finish the cooking at 145-150° and you will still have a very succulent pork meal. 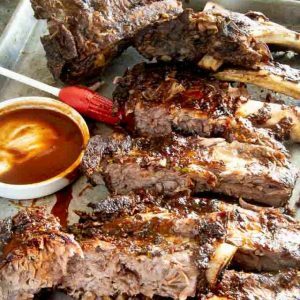 I’ve done this recipe with success with a bone in pork shoulder too and it is fall off the bone tender. If you want to make this in the oven, which is how the original recipe from the movie is done it is easily adapted. (See the original recipe here.) To make it in the oven, you would heat the oven to 425° and place the pork roast on a wire rack over a baking sheet. Roast the pork for 30 minutes at which point it will be lightly browned. Then reduce the heat to 375° and roast for another 30 minutes or until the meat thermometer reads 150°. You will then rest the meat the same as in the recipe. If you have leftovers you could make sliders with the pork on Hawaiian rolls with a sweet honey mustard sauce. This recipe goes great with rice, simple green beans or cheesy mashed potatoes found in the Shepherds Pie recipe. It also pairs well with grilled cheesy endive. Add this recipe to your repertoire for summer grilling season when you want to entertain but don’t want to spend hours in the kitchen. You can marinate this the day ahead, get home late from work or a long day of weekend activities and just slap it on the grill. You have to watch it the first little bit while its searing, but after that you can sit back and let the grill work its magic! PIN THIS TO YOUR GRILLING BOARD OR EASY DINNER RECIPES FOR ENTERTAINING BOARD so you can find it easily when you need it. You can also follow me on Facebook here for more easy recipes for entertaining! WATCH THE VIDEO TO SEE HOW EASY TO MAKE THIS RECIPE! Remove pork from packaging, rinse and pat dry with a paper towel. You want to trim away big pieces of fat from the roast if there are any. When cooking on the grill the fat will cause flame ups and burn quite quickly. Into a ziplock back, place olive oil, orange zest, juice, lime juice, cilantro, mint, garlic, oregano, cumin and brown sugar. Mix well. Then place pork roast into the bag and seal removing out as much air as possible. Make sure to move the marinade around to cover the entire pork roast. Place bag in a bowl in the refrigerator and let marinate for at least an hour, up to overnight. The longer the more flavor is imparted. When ready to grill, remove pork from the bag and save marinade. Pat the roast dry and season with salt and pepper. Preheat gas grill to high(450-500°), using all burners. Once grill is hot, sear all sides for 7 minutes browning well. Then turn off one section of the grill to leave the pork on. Ideally it will be the middle of the grill, but if you only have 2 gas knobs to use, just turn one off and place the pork on the side that is turned off. Using this indirect heat cooking method you will not overcook and cause the pork to be dried out. Reduce heat to medium high(350°) and close the lid. Cook for about an hour or until pork reaches 145-150°. 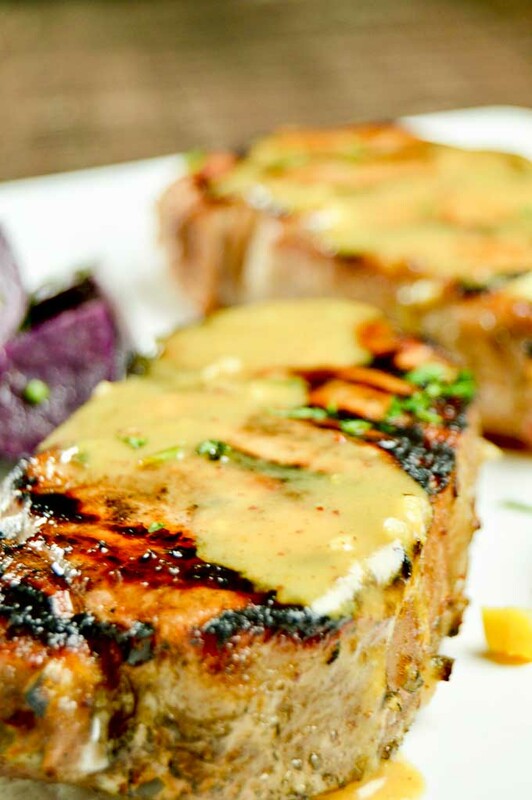 Remove from grill, and let rest for 10-20 minutes to allow juices to remain in the pork. If you cut into it right away, all of the juices will pour out onto your plate. 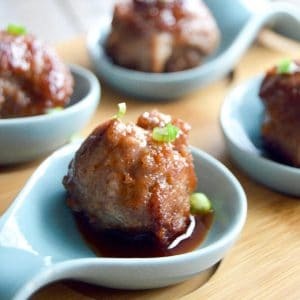 By waiting, the pork juices remain in the meat for the juiciest, most tender bites of pork. 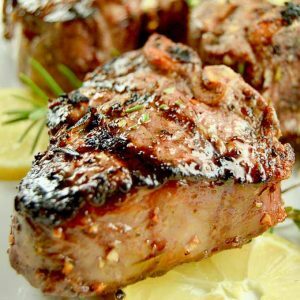 While the pork is grilling, place the marinade in a small sauce pan, add one teaspoon of olive oil and bring to a boil for 10 minutes. Remove from heat and bring to room temperature. 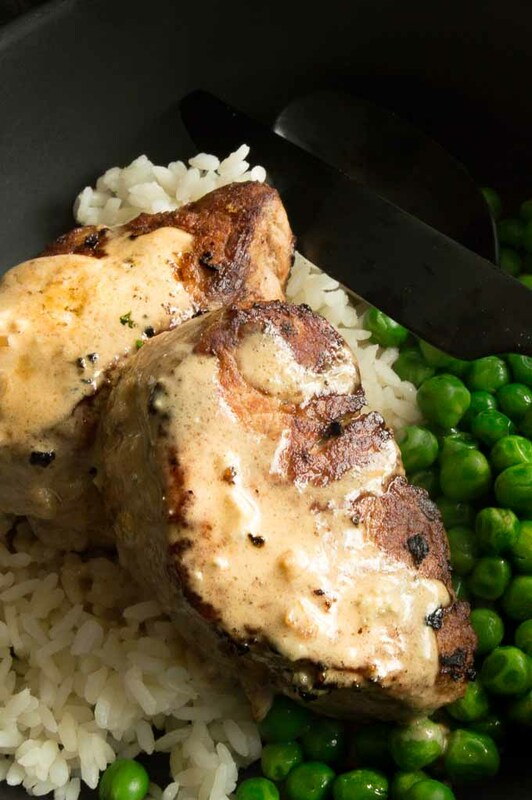 Cut the pork against the grain and serve with a spoonful of the cooked marinade over the top. Yes, by all means you can do this in the oven. Id probably sear both sides in an oven proof pan before hand. Id try it at 400 for 15-20 minutes in the oven aiming to get it to 135-140 degrees internal temp(we like our pork a little pink in the center) If you like yours more done aim for 140-145 degrees then let it rest for a 10 minutes before cutting. Could you put this recipe in a crock pot? 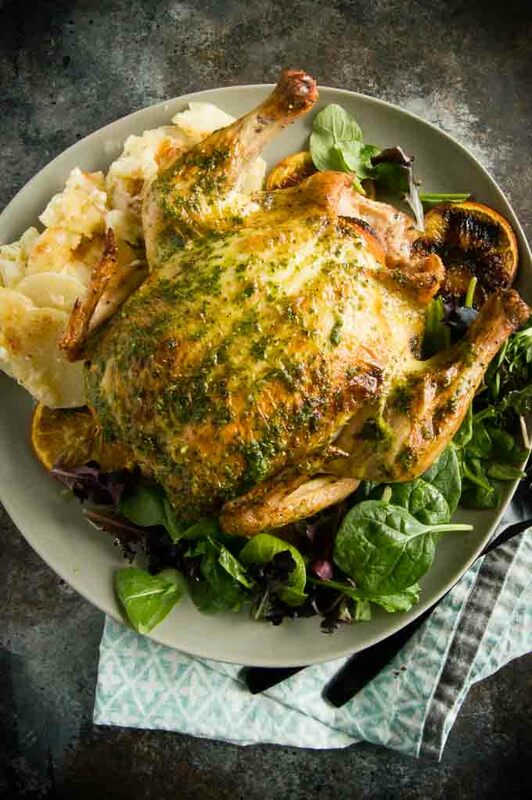 how long and at what temperature would you cook this in an oven? I would sear it on the gas grill for the crust then transfer it to a Treager set at 350. I’m going to try this since I have both kinds of grills. I roasted mine on a charcoal grill indirectly in the center. Lid on until the outside was brown and crispy. 45 min. Will vary. Then in crock pot on low 3 hours. I let mine cool completely in the crock until the juices we’re reabsorbed. We made this over the weekend for the long holiday…. I can’t believe how perfectly the pork turned out. We had just moved into a new neighborhood and all of my new neighbors asked for the recipe. How much lime juice? You don’t mention it in the ingredients, but stay in the instructions to add lime juice! The recipe looks wonderful, but where does the brown sugar go? I am such a fan of Cuban Mojo sauce! 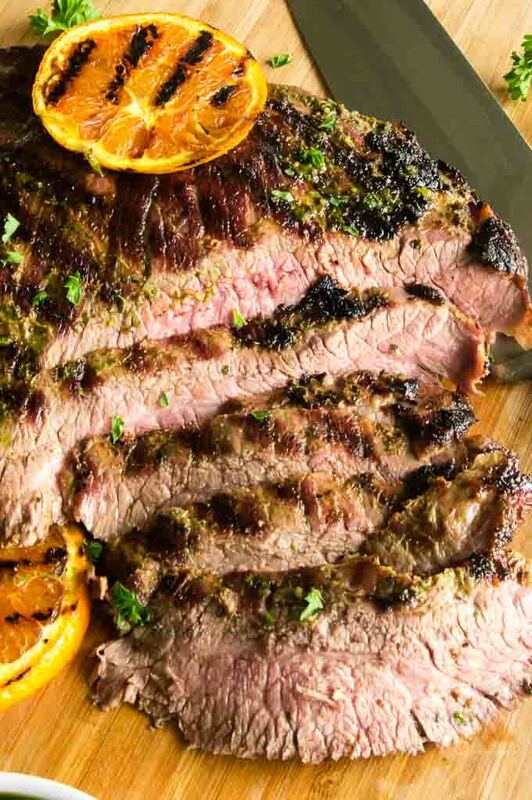 The combination of the citrus with the garlic and herbs is just so great with grilled meats. 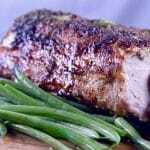 This pork roast looks perfectly tender and must be so flavorful with the marinade. Love the idea of using the leftovers for sliders with Hawaiian rolls! I love the movie Chef! This is making me want a Cubano sandwich! How delicious! Would be able to use this in so many ways too. Fresh & bright, perfect for summer. The char on that looks like absolute heaven!!! This looks so tasty! The flavors that you have going here, and to form that outer crust sound just amazing! What a lovely meal! Michele, this looks SO, SO good! That crust! Amazing! Wow! This looks so good! I love grilling pork! This seriously is making me want dinner NOW!